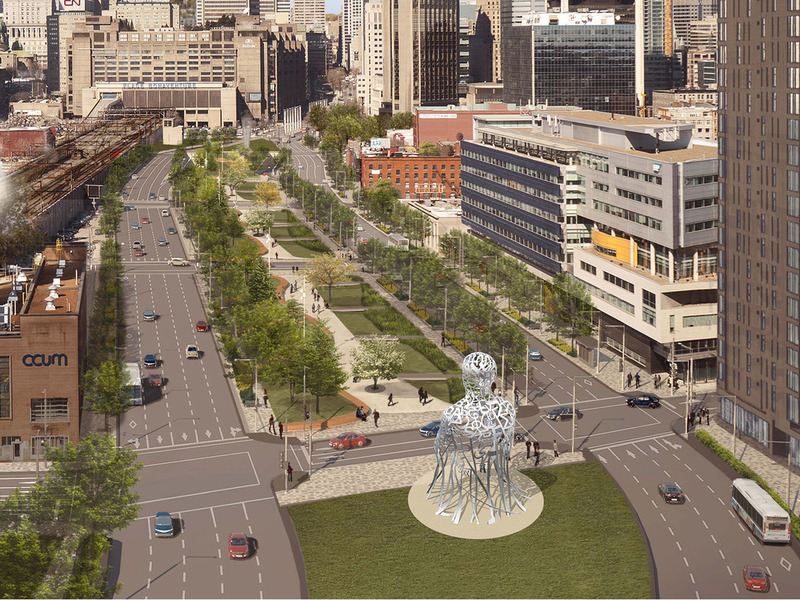 The Bonaventure gateway to downtown Montreal will be enhanced with a work of public art created by the internationally known artist Jaume Plensa. Montreal will receive this artwork for its 375th anniversary thanks to the contribution of two major patrons, France Chrétien Desmarais and André Desmarais. This collaboration for a public art project created by an international artist is a first for Montreal. 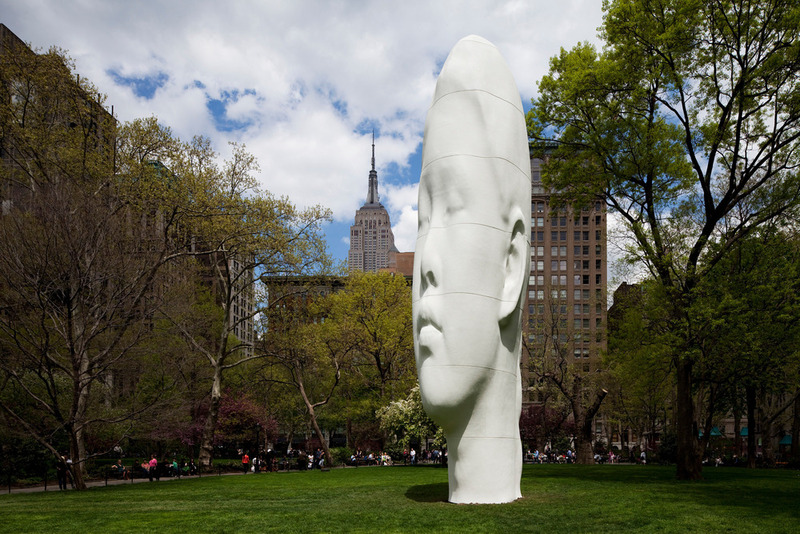 The agreement concluded between the patrons and the City of Montreal provides for the loan of the work of public art Source by the Catalan artist Jaume Plensa for a minimum duration of 25 years. Since 2011, like a growing number of large cities, Montreal has undertaken the major project of demolishing an elevated expressway in the heart of the city and replacing it with an urban boulevard, thus reintegrating neighbourhoods that had been enclaved and re-energizing an entire district. 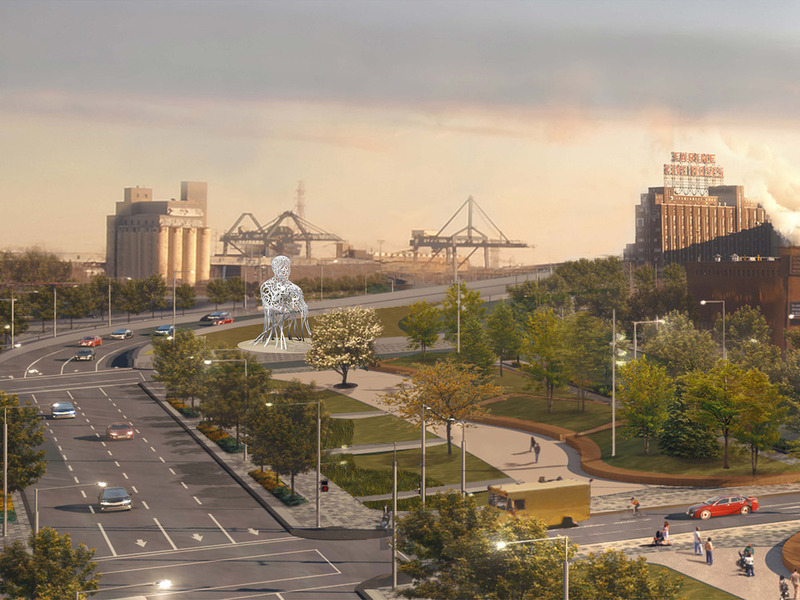 Situated at the intersection with Wellington Street, at the southern threshold of the future Robert-Bourassa Boulevard, this artwork will become an important reference point for the city. The sculpture Source will be about 10 metres in height and will face the city. Currently in the design stage, the work will be inaugurated in September 2017 during the celebrations of the 375th anniversary of Montreal. In developing Source for Montreal’s 375th anniversary, Plensa was conscious not only of the city’s history as dependent on water for trade, immigration and communication, but also the history of the First Nations as Montreal’s founders. Source, a word identical in both French and English, refers to the origin of a spring, but it may also be understood equally as the root of a city’s energy and vitality: its people and their origins, their fluidity and creativity of ideas, reciprocal cycles of movement and renewal. To Plensa, “Source is talking about our body as a gathering place, as a palace of dreams.” Even more, Source stands an emblem of Montreal’s rich history rooted in the city’s founders, the First Nations. Source belongs to a family of sculptures, each a figure composed of letters in random arrangement from multiple alphabets including Latin, Arabic, Chinese, Japanese, Hebrew, and Cyrillic. These sculptures, variously titled “soul,” “roots,” and “we,” make physical Plensa’s metaphor for language, as well as the poetry of building a single unit from many components: cells make up the body, letters construct words, people form a community. Source is a metaphor for the richness of cultures passing through Montreal in the nearly four centuries since its founding. As a symbol for Montreal of the past, present and future, Source, whether illuminated at night or seen in the day, invites the inhabitants of the city to walk, to dream and to encounter. 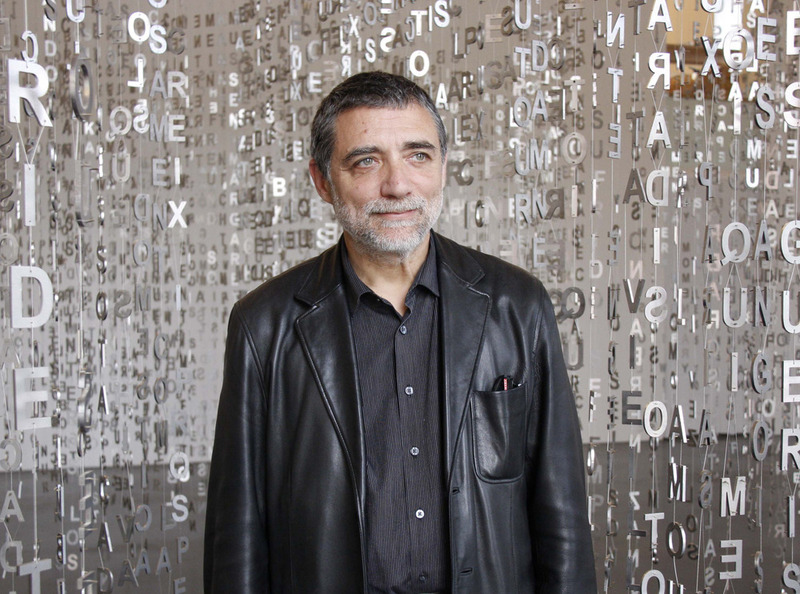 Jaume Plensa creates sculptures and installations that unify individuals through connections of spirituality, the body and collective memory. Literature, psychology, biology, language and history have remained key guiding elements throughout Plensa’s career. Using a wide range of materials – including marble, alabaster, steel, cast iron, resin, paraffin wax, glass, light, water and sound – Plensa lends physical weight and volume to components of the human condition and the ephemeral. On the occasion of the 56th International Art Exhibition of la Biennale di Venezia, one of Venice’s most celebrated landmarks, the Basilica of San Giorgio Maggiore, hosted Together; a conversation between two sculptures – a hand suspended beneath the cupola in the foreground of the altar and a head sited in the nave. Located near the basilica’s entrance, the Officina dell’Arte Spirituale, housed meticulous drawings and five alabaster portraits by Plensa. 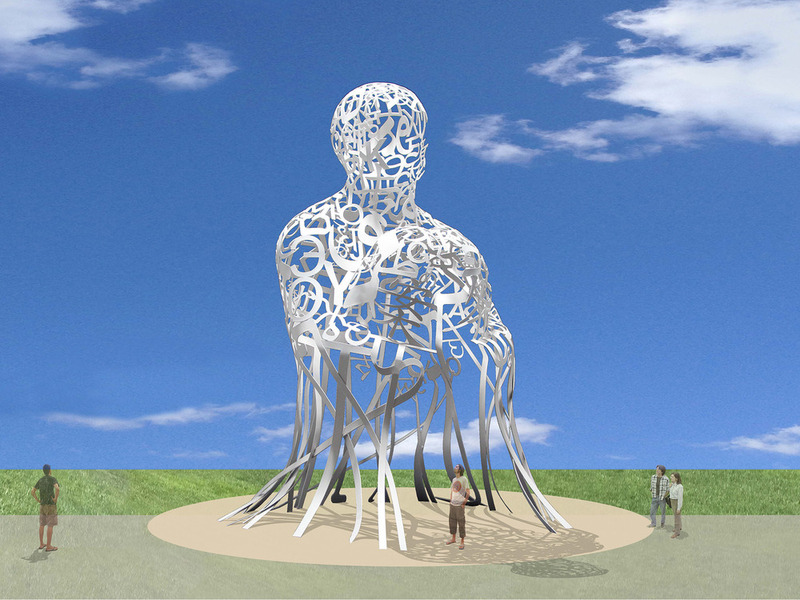 In June 2016, The Toledo Museum of Art will present Jaume Plensa: Human Landscape, a major exhibition of large outdoor sculptures and indoor installations that previously traveled to The Frist Centre for the Visual Arts, Cheekwood Botanical Garden & Museum of Art and the Tampa Museum of Art.